Preheat oven to 375°. In a bowl, cream the sugar and butter together. Add eggs and beat one more minute. In a separate bowl, sift the flour together with the baking soda, nutmeg and the cinnamon. Add flour and buttermilk to the first mixture, mix at low speed until smooth. To avoid lumps in the batter, add the wet and dry ingredients alternately, in small amounts. Make the nut topping: Mix all ingredients together in a small bowl. 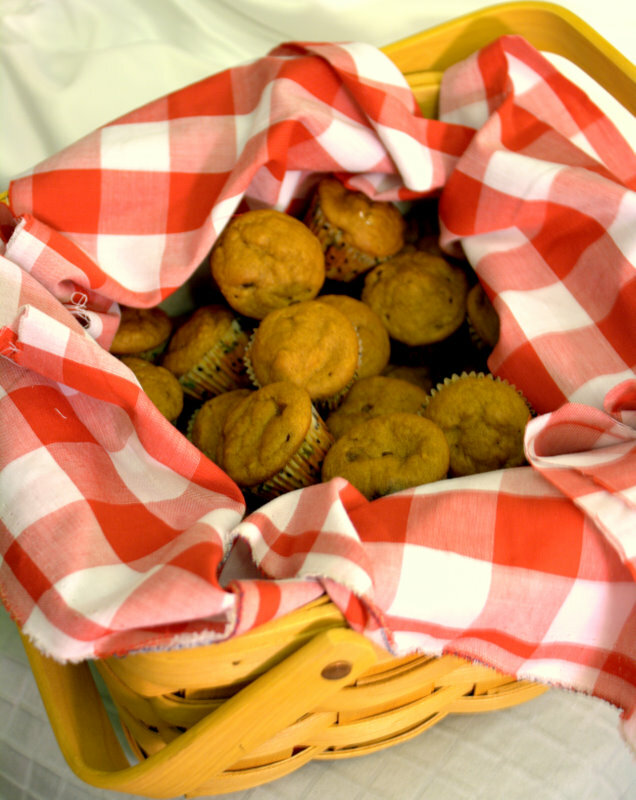 Grease muffin tins or use paper baking cups. Fill each cup 3/4 full of batter. Add a full, rounded tablespoon of nut topping on top of each muffin cup of batter. Bake immediately at 375° for 20-25 minutes, until golden brown or the topping will sink to the bottom of the muffin. Makes about 12 standard size muffins. 1. Preheat oven to 400 degrees. Line mini muffin pan with mini baking liners. 2. In a bowl, mix brown sugar, eggs, and oil together. Add canned pumpkin and water. 3. In a separate bowl, mix the flour, baking powder, baking soda, pumpkin spice, cinnamon, salt, and nutmeg together. 4. Add dry mixture to wet mixture. Dredge chocolate chips in 1 tsp of flour to prevent sinking. Stir in chocolate chips. 5. Fill the muffin liners until almost full. Bake for about 15 mins. Hey! I know this was a few entries down but I don’t know if you check those comments… I saw that you want to know how to make the Olive Garden breadsticks and I have a recipe that is supposed to be the copycat of it from Food Network Magazine…never tried it but it looks like it could be right! 1. Place 1/4 cup warm water in the bowl of a mixer, sprinkle in the yeast and ste aside until foamy. About 5 min. Add the four, butter, sugar, fine salt, and 1 1/4 cups plus 2 tbsp warm water. Mix with paddle attatchemnt until a slightly sticky batter forms. 5 min. 2. Keand the dough by hand on a foured surface until very smooth and soft, about 3 min. Roll into a 2 foot long log, cut into 16 1 1/2 in long pieces. Knead each peace slightly and shape into a 7 in ong bread stick. Arrnage 2 inches apart on a parchment lined baking sheet. Cover with a cloth, let rise until almost doubled (45 min). 3. Preheat oven to 400, and brush the bread sticks with 1/2 the melted butter then sprinkle with 1/4 tsp kosher salt. Bake until lightly golden (about 15 min), meanwhile mix the remaining salt with the garlic powder, and oregeno. When you take the breadsticks out of the oven brush with remaining melted butter and “seasoned salt”. thank you so much for the recipe! definitely going to try it out!